Without the right tools, it's hard to accomplish really anything. I'm on a budget, so I had to spend my money wisely on the right tools that will help me get the job done and that will also last long enough. I'm the kind of guy who likes to etch his own PCBs, so I needed a tool to make the pin holes for the electrical components, and this need led me to the Dremel 300. It came with 24 accesories that I'm slowly finding use to. In the electronics lab where I used to take classes, we had a work station to use the Dremel, and it was as easy as pulling a lever to make those pin holes straight. 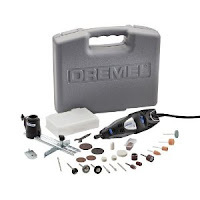 That led me to finding necessary the Dremel 220 Work Station. The Dremel 300 came D.O.A., but I shipped it to the Dremel facilities with my proof of purchase, and they returned it back fixed at no extra cost to me. Sometimes you need a strong and steady hand to hold your PCB when drilling or soldering, and since I had already seen a vise at the electronics lab, I knew what I had to get. The PanaVise 301 was my choice: it is heavy and has nice grip. After you have a tool like the Denali Cordless Screwdriver, friends will tell you how lazy you are. But in my case, I don't care! I removed a motherboard, power supply and drives from a computer case in just a few minutes, a task that would have taken me about 3 times that with a simple screwdriver. It comes with a wall charger that you can hang on the wall with two screws. It's not very powerful, but will get the job done in most cases... but you wouldn't want it to be too powerful either, right? This is the kit I got so that I didn't have to go buying all the standard tools separately. 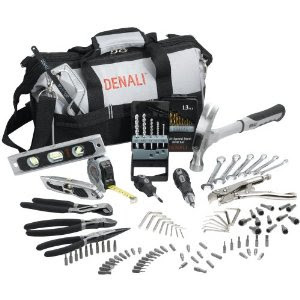 From the image you can see what the Denali 115-Piece Tool Kit is all about. The carrying bag is pretty handy. The two things that I found missing here are the mini/small pliers used in electronics and the precision screwdrivers, so I had to get those separately. For the tough holes, I got the Black & Decker DR550 Drill, it's quite powerful when in use, and sounds like a turbine because of the design used to take the heat out of it. It's hard to desolder boards without the right tool, so I got the Kawasaki 840015 Heat Gun, which does the job nicely. It's packed with a few jets for scraping and the like, as well as scraper handle. You can also use this baby with shrinking tubes... it is indeed a bit big for such task but it just works. To strip wires, I bought the Irwin Self-Adjusting Wire Stripper, which I found a bit pricey for what it does but in the end it was a good decision. No longer I have cut wires while trying to strip it with pliers. You can adjust the length of the wire that you want exposed with this tool.